I am a completest. I did not watch the original MATRIX a couple weeks ago figuring I would revisit the entire trilogy. However, like the subject matter of the film itself, I should have known that sometimes choice is not what it seems. The question was not if I would watch the last two, but when. My memories of the second and third MATRIX films are not particularly fond. I’ve always considered it a series which starts strong and becomes increasingly tedious. I am glad to revisit this series so I can secure my feelings on them. Suffice it to say that there are sections of the second film which are wonderful, and other sections which are woeful. Lets start with the bad. I have a huge problem with the 1 vs. 100 Neo vs. Smith scene. Its not the content, though it becomes silly. Its mostly the CGI. 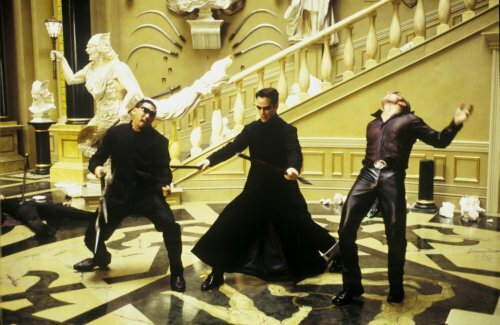 Sorry, but watching fake cartoony Neo fight CGI Smiths does nothing for me. The fights in the first film are monumental, even in their fabricated way. But once it stopped being actors and started being a program, I lost interest. I find it ironic that a film which sends a message about how humanity has become a slave to computers relies so heavily on CGI. I also find the first act a little rough. I wouldn’t be the first to say that the series jumps the shark (or nukes the fridge, or whatever) when Zion becomes an ecstasy fueled rave. While I have a strong dislike for that scene, I can forgive it because it is one moment in a trilogy. I think there could be better ways to tell the story of how this underground city works. I think the fault here is in the Wachowskis’ writing. So what do I like? Well, many of the fights are top notch. I dig the freeway scene and I love Neo’s fight with the Oracle’s protector. I am okay with the hallway fight, and I love the fight in the master hall with the multitude of weapons. That last one is a fight choreographer’s dream. I also like the performances. I like seeing Morpheus find levels of doubt. I like Jada Pinkett Smith in her small role here, and I think Link (Harold Perrineau from LOST) is a wonderful addition to the team. Keanu does what he does, and doesn’t screw anything up. I still am not a huge Trinity fan, but her character is better here than in the first. I’m mixed on the matrix as a setting. I appreciate the idea of tinging everything in green to push that point of disjointed reality. I just wish that they had thought of it in the first place so the fist and second films wouldn’t feel like they exist in different worlds. Ultimately, the colorization both does what it intends too in the narrow scope of this film, but slightly betrays the trilogy. ~ by johnlink00 on February 2, 2010.